It’s my birthday today – December 1st. I’ve never been one for celebrating birthdays. I love celebrating those of others but since I turned 21, my enthusiasm of being able to say I’m a year older has been non-existent. It’s a bittersweet birthday for me. One I really won’t be celebrating. One where a lot of friends have asked what they could do rather than what they could get me. I don’t have children. Not that I haven’t wanted children but circumstances just haven’t had it happen for me yet. Tony (who is in the picture to the right) and his siblings (there are 3 left – Pina (his sister), Sasha (another Siamese) and Frisky are the closest things I’ve had to kids. Although I love each one of them dearly, Tony and I have had a very special bond. You see, when he was around 6 months old, he became very sick. His regular vet recommending removal of an eye and that it was likely he wouldn’t make it even with that. (He had a massive infection.) I didn’t want to give up on him. I found a specialist vet who was able to treat him. It involved frequent long trips but more importantly giving Tony meds every hour for a month. We formed a really special bond during that time. You know how kittens are incredibly affectionate? Before getting sick, Tony had – like most cats – started to outgrow that affectionate side. But when he was sick, there was a connection made. He seems to think I’m his real mom. The bittersweet part of my birthday is that last Friday, we found out that Tony has terminal liver cancer. He has a growth the size of a baseball. Neither chemotherapy nor radiation are viable options with this type of cancer. Due to his age and clotting issues with liver cancer, surgery isn’t an option – the risks are too high. I wouldn’t want to put him through that. And so, I’m left with 3-7 more weeks of expected time with Tony. I’m making the most of the time I have left. It is truly heart breaking to see him deteriorating and ups and downs within a single day. Earlier today he had a major crash. It was likely from becoming dehydrated. But re-hydrating him every 30 minutes showed speedy results. I’m unbelievably crushed right now. I really had thought he was going to be one of the cats you read about who live until well into their 20’s. Just a couple of months ago, he was jumping up into my arms from the ground, running around playing tag with Frisky and acting more like a kitten in many ways than most kittens. I can’t remember the last time I prayed. I was raised a Catholic, but have definitely lost my way as far as religion goes. But I have. 14 years ago, I nursed Tony back to health when others said to give up. Doing that gave us 14 super years together. For that I am thankful. I am once again nursing him, but this time I know there is no recovery. There’s not anything anyone can do for Tony except for me right now. But with Christmas around the corner, there is something we can all do for millions of cats and dogs. That’s to spread a very important message. If you are a friend – or just another animal-lover – I’d really appreciate if you could share this post. Click the tweet button if you are Twitter, the Facebook share button if you are Facebook, the Google+ if you are on there – or any other network. Shares to more than one network are even more appreciated. Please, please carefully think things through before getting a kitten or puppy for your family as a Christmas gift. (Or for that matter at any time.) If you do decide it is the right thing, then please go to a reputable local animal shelter versus going to a pet store or breeder. I’ve had trouble finding exact numbers, but I do know that from December through March, the number of animals abandoned at or entering animal shelters goes up tremendously. Many people get kittens and puppies thinking they are cute, but without realizing what is involved with owning a pet, how it may impact their household, forgetting that the cute kitten or puppy grows up into a cat or dog and other issues. The major reason people leaving animals with shelters give for leaving their pets is that they are moving. To give a broader view of the scope of the problem – this works out to around 22,000 animals going into shelters daily or about 1 every 4 seconds and 1 animal being euthanized about every 8 seconds. With the growth of no kill shelters, the push towards sterilization of animals, improved care and knowledge at shelters in general, the numbers have been improving. With some areas also passing laws which allow sales of animals only to take place through shelters and breeders, hopefully the adoption rate will improve and reduce the number of animals euthanized. This is a partial list of some things you’ll want to consider before getting a kitten or puppy. If you have children, consider their ages and possible allergies. If you have other pets, consider how a new addition will fit in. There is a tremendous difference between one breed and another – do some research. Some are better with younger children than others. How much time do you have available to care for it? Who will be responsible for feeding, walking, playing, vet visits? Do you have the money to deal with day-to-day care of the pet and health care? What do you need to do to kitten- or puppy-proof your home? If you are in a community, apartment or condo with pet restrictions, will the pet be compliant? Do you have a move coming up that may impact being able to keep the pet? As I can readily attest, having cats and dogs can bring tremendous joy to our lives. If the circumstances are right for you and your family to get one, it can be a wonderful experience. If you do decide to get one, then do some research on local shelters rather than just going to a local pet store or breeder to get one. There is a wide difference between one shelter and another. Also, some shelters are strictly no-kill while others are partly no-kill (they will not euthanize healthy animals). Around Christmas, because the desire for kittens and puppies is much higher, you might find it more difficult to find one at a shelter. However, there may be adult cats and dogs available for adoption. If you really want a kitten or puppy and can’t find one available, plan on looking right after the holidays when the drop-off rate at shelters will likely be up. If you have the time and resources, opting for an animal with some health issues might be something to consider since that may mean saving a life. As I’ve shared, Tony had serious health issues when he was young and with careful care and love, he has lived another 14 great years without any other health issues. Given the increased need of shelters at this time of the year, consider making a donation of food, other items or money to a local shelter. Each year, at Christmas, I bring food to our local SPCA (the only option locally). Call your local shelter to see what they need most before automatically assuming. Some shelters would prefer gift certificates or cash donations since they are selective in what they buy. If you have friends and family members who mention they are considering getting a pet for their family for the holidays, suggest to them kindly to make sure it is the right decision and encourage them to go to a shelter. For almost a decade, I had 7 cats and yes, I had rescues amongst them. 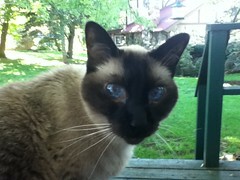 Sasha, although a purebred Siamese, was indirectly a rescue since she was an older kitten when we adopted her – no one had wanted her. But in the future, any pets would definitely all be rescues. I have more pictures of my cats at Flickr where you can see more of Tony and his siblings Pina, Sasha and Frisky.